Frequent visitors here know that my photos are a mixed bag in terms of genre – some have more artistic merit than others, and some are quirky and just for fun. Some are personal anecdotes of encounters in my kayak, and some the field notes of a naturalist. One thing they all have in common, though, is they’re wild creatures observed in nature along the waterways of Eastern Massachusetts. Coming up on the horizon in a few months is my next one-woman photography show, comprised of 35 photos. For the most part in the past, pieces I’ve included in the galleries are different than the ones I post online, selections made in a vacuum, by myself. As a new approach for 2015, I’m reaching out to readers here for your input, for your votes on which of the 2014 posts you like the most. So, after the photos posted here, there’s a poll where you can let me know which are your favorites. I do hope you participate, and I’m looking forward to seeing your responses. Wishing peace, prosperity, and creativity to all in 2015! 1) And so the migration begins. 2) Great blue heron by shadow of chain link fence. 3) Great Blue Heron fledgling sticks the landing. 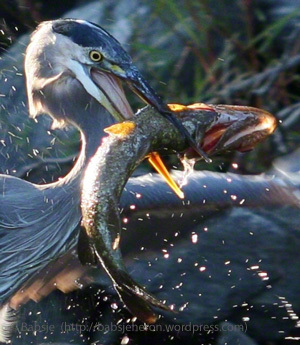 5) Great Blue Heron fishing as the waters descend. 7) Great blue heron flies by. 8) Great blue heron poised under railroad bridge. 9) Years ago before I knew it was illegal, I gathered these aigrette feathers. 11) Great blue heron resting along the shore. 12) Great blue heron with wings akimbo in the cove. 13) Is the Heron a modern-day Benu Bird, a relic of ancient Egypt? 14) Great Blue Heron in the rain. 15) Great blue heron preening. 16) Great Blue Heron’s erect back feathers stand on edge in territorial display. 18) Bonus Bird: Yes, I know this is not a Great Blue Heron. Thanks to Michelle W and WordPress for the Weekly Photo Challenge: New. Soliciting the opinions of others about which photos to include in the upcoming show is a new approach for me. Like many artists and writers, I’m often surprised by what resonates with people. Looking forward to being surprised by the poll results here! Posted on January 3, 2015, in ardea herodias, Art, Audubon, Birds, Egret, Great Blue Heron, Nature, Nature Photography, Photo Essay, Photography, Photography challenge, postaday, Weekly Photo Challenge, Wildlife Photography and tagged great blue heron, postaday. Bookmark the permalink. 19 Comments. Foe me, that is the top 7 shots I like. Hope that helps you. What a difficult choice. I loved #2, a very apt visual for the juxtapostion theme, although it was a tough call between that the the fear of owls 101, and the final bonus bird. Will you let us know the poll results? Great, look forward to seeing what others voted for. Beautiful review, Babsje. I love the feathers and the graceful flight captures. Happy New Year! Quite the year Babsje! I didn’t actually vote but my favorites are the birds in flight. So beautiful and very difficult to capture without shadows. You did a great job. I too featured ONE photo of a great blue this week – stop by for a look! Happy New Year to you! Remarkable photos, Babsje! You’re an amazing photographer and that fact that the great blue is my 2nd favorite avian (raven is my fave) is a bonus. Thanks for a visually enchanting year and all the best in 2015. Babsje, While all of your photos demonstrate your careful attention to the world, I see some things in this selection that deserve more than a vote. I find #2 particularly moving–the shadows of chain link cast over a living being. I cannot help but think of refugees from the war in Syria, the tension between captivity and freedom. I love #14 for its whimsy and again the tension between the windblown hackles and the controlled feathers of flight. #16 reminds me that the best photos are about interaction, here between the heron and the unseen threat to its territory. I love the humor in #s 10 and 17. I also admire your ability to sense the relationship between the conscious living being of the heron and the inanimate and constructed world of the stone bridge, as in #s 6 and 8. Thank you for sharing these remarkable images with us.